The Regalia of Romania are a set of items which were used for the coronation of the kings and queens of Romania. They are currently housed in the National Museum of Romanian History in Bucharest. The regalia consist of the Royal Crown (the so-called “Steel Crown”), the Crown of Queen Elizabeth, the Crown of Queen Maria, orbs, the Scepter of King Ferdinand I the Scepter of King Carol II, the Sword of King Carol I and the Royal Mantle. The Romanian “Steel Crown” is the crown which was used for the coronation of the Romanian kings. It was cast of steel from a Turkish cannon which was captured by the Romanian Army during the Siege of Plevna in the Romanian War of Independence (1877-1878). King Carol I chose that the crown be made of steel, and not gold, to symbolize the bravery of the Romanian soldiers. In addition to the absence of gold the crown contains no precious stones. The crown was presented to the king on May 10, 1881 during the ceremonies of his coronation and of the proclamation of Romania as a kingdom. On October 15, 1922 the crown was used for the coronation of King Carol I's nephew and successor, King Ferdinand I, as well as, the coronation of Romania’s last king, Michael I on September 6, 1940. The planned September 1930 coronation of Ferdinand’s son, King Carol II, who was also the father of King Michael I, never occurred due to his relationship with Magda Lupescu. The Crown of Queen Elizabeth, was made of gold at the Arsenalul Armatei, for the occasion of the proclamation of the Kingdom and the coronation of King Carol I and Queen Elizabeth in 1881. The crown follows a medieval design similar to that of the Royal Steel Crown, and it, too, does not contain precious stones. The Crown of Queen Maria was made of gold mined from the Transylvania region of Romania. It was constructed specifically for the occasion of the coronation of King Ferdinand I and Queen Maria in 1922 at Alba-Iulia. The Crown has a very original design. Rather than wearing the crown of Queen Elizabeth, Queen Maria had reportedly told her husband “I want nothing modern that another queen might have. Let mine be all medieval.” The new crown was modeled on one having belonged to Milica Despina of Wallachia, the consort of a 16th-century Wallachian prince. It contains rubies, emeralds, amethyst, turquoise and opals and weighs 4 pounds (1.8 kg). Grains of wheat decorate the base of the crown topped by eight large and eight small flower ornaments connected by interlacing branches. A globe and cross sit atop the eight arches above the flower ornaments and a pendulae, supposedly copied from ancient Byzantine head ornaments, hangs from both sides of the headband just above the ear, each bearing the Coat of arms of Romania. From each of these pendulae hang three chains, each with a cross within a gold circle at the end. The Scepter of Ferdinand I, was constructed in Alba-Iulia for the coronation of King Ferdinand I in 1922. It was presented to the king on May 10, 1920 by six girls from the orphanage Radu Voda, and is inscribed "King Ferdinand I, King of the Romanians is presented this gift by his people as a reward for his worthiness and good governance of the country during the years 1916-1919". At the top are four images of peasants in national costumes representing Transylvania, Bessarabia, Bukovina and the ancient kingdom Romania. The head of an eagle sits atop the scepter and symbolizes the Latin origin of the Romanians. The Scepter of Carol II was presented by Romanian Army officials to King Carol II in 1940 for the 10th anniversary of his ascension to the throne. This scepter is similar to the Scepter of Ferdinand I. The Sword of King Carol I was a present to King Carol I by Ottoman Sultan Abdul-Aziz. Its blade is crafted from Damascus steel and it has a gold plated handgrip. The sheath contains 1140 jewels including 46 diamonds. The coronation of King Carol I. The coronation of King Ferdinand I. Coronation photo of King Ferdinand I. King Ferdinand I in full regalia. ^ David Williamson, Debrett's Guide To Heraldry And Regalia page 152, Headline Book Publishing PLC 1992. Wikimedia Commons has media related to Category:Regalia of Romania. This Romanian history-related article is a stub. You can help Wikipedia by expanding it. Alba Iulia is the seat of Alba County in the west-central part of Romania. Located on the Mureș River in the historical region of Transylvania, it has a population of 63,536. Iuliu Maniu was a Romanian politician. A leader of the National Party of Transylvania and Banat before and after World War I, he served as Prime Minister of Romania for three terms during 1928–1933, and, with Ion Mihalache, co-founded the National Peasants' Party. 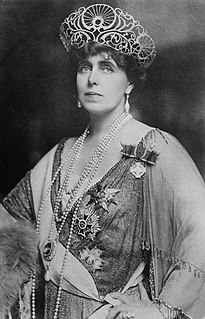 Marie of Romania, also known as Marie of Edinburgh, was the last Queen of Romania as the wife of King Ferdinand I. Great Union Day occurring on December 1, is the national holiday of Romania. 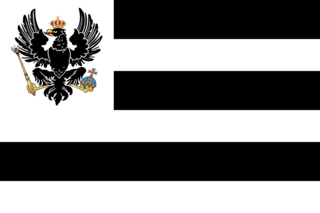 It marks the unification of Transylvania, Bessarabia, and Bukovina with the Romanian Kingdom in 1918. This holiday was set after the Romanian Revolution and commemorates the assembly of the delegates of ethnic Romanians held in Alba Iulia, which declared the Union of Transylvania with Romania. The Steel Crown of King Carol I of Romania was forged at the Army Arsenal in Bucharest from the steel of a cannon captured by the Romanian Army from the Ottomans during its War of Independence (1877-1878). Ținutul Mureș was one of the ten ținuturi ("lands") of Romania, founded in 1938 after King Carol II initiated an institutional reform by modifying the 1923 Constitution and the law of territorial administration. It comprised most of Transylvania, and included part of Székely Land. Its capital was the city of Alba-Iulia. Ținutul Mureș ceased to exist following the territorial losses of Romania to the Axis powers and the king's abdication in 1940. Samoilă Mârza was an Austro-Hungarian-born Romanian photographer. A native of Transylvania region and a veteran of World War I, he is best known for taking the only photographs of the Great National Assembly at Alba Iulia that proclaimed the Union of Transylvania with Romania on December 1, 1918. The day is celebrated as Romania's national holiday, and, with time, Mârza's images acquired political and documentary significance. The Coronation Cathedral, dedicated to the Holy Trinity and the Holy Archangels Michael and Gabriel, is a Romanian Orthodox cathedral located at 16 Mihai Viteazul Street, Alba Iulia, Romania. Built soon after and in commemoration of the Union of Transylvania with Romania, it is the seat of the Romanian Orthodox Archdiocese of Alba Iulia.